I'm making an effort to dig into my "to do" stack - projects that I put aside for later. 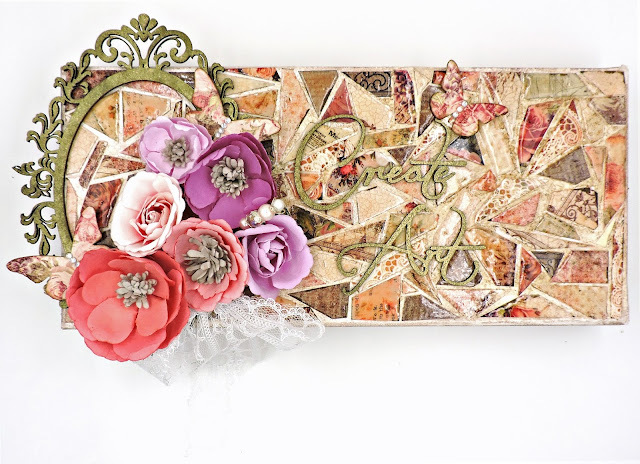 At the top of the pile, I found the Swirlydoos Project from January, featuring Tim Holtz's Distress Paper Mosaic Kit, along with a 12" x 5.5" canvas, a chipboard frame from Dusty Attic, some Darice crystal rhinestones, a package of Prima flowers and a length of beautiful May Arts lace. I had been putting aside scraps from Prima's Tales of You and Me collection for this project; these were cut into various shapes and sizes to form my mosaic. Following the instructions on the Tim Holtz packaging, I applied a layer of Grout on my canvas, smoothed it out and left it to air dry. Next came the (messy) fun: using the Glue to adhere my paper tiles - spreading a small amount onto the canvas and a bit more to the bottom of the paper, then putting it in place, being sure that each piece was well contacted to the surface. The next step was the Glaze; each tile was covered with a light coating, using the applicator to smooth it out. After allowing this to set overnight, I gave my mosaic an aged look by applying Walnut Stain Distress Ink over the entire surface, then misting it lightly with water and going over the entire surface with a paper towel. Not only did this take the ink off the tiles (the Glaze acts as a resist), but it gave the areas in between a more mottled appearance. I've used two chipboard embellishments: the Dusty Attic Vintage Frame 7 from the kit and two pieces from the Creative Embellishments Inspire Word Set from my stash. These were first coated with the Walnut Stain Distress Ink and then misted with Prima Color Bloom in Empress Gold. I used the entire package of Prima Royal Menagerie #583309 flowers around the bottom of the frame, along with the May Arts lace tied in a bow. The butterflies were cut from the Spellbinders Cascading Butterflies from the August Die Add-On and embellished with the pretty Darice rhinestones.